Rocky Mount Mills was founded in Rocky Mount by Joel Battle and two partners in 1818. Its original facility was the second cotton mill built in North Carolina, following the 1814 Schenck-Warlick Mill near Lincolnton. By 1825 Battle was the sole owner of the mills, which were built on a 20-acre tract at the falls of the Tar River. After Battle's death in 1829, the mills were owned by Battle and Brothers, a firm headed by his eldest son, William H. Battle. The Wilmington Journal of 19 Feb. 1869 described the original mill as built "of rock-granite-with which the spot so abounds, and three stories high with a basement." The mill was powered by a large dam, which also powered a gristmill. The mills were run by slave labor until hired workers, most of them girls and women, replaced the slaves in 1852. The Battles usually employed 50 to 60 mill hands, who were paid approximately $2.50 a week during the late 1860s. Many lived near the mill in what were described as "neat white cottages, sufficiently numerous to have the appearance of a village." As one of the biggest industrial complexes in North Carolina, Rocky Mount Mills became the target of a Union cavalry raid during the Civil War. On 20 July 1863, Brig. Gen. Edward E. Potter's forces raided Rocky Mount and Tarboro, and six cavalry companies were sent to destroy the mills. They burned the cotton mills and gristmill, along with the other buildings and vast amounts of cotton, yarn, flour, and hardtack. According to local tradition, the nearby Battle home was spared because the mill's superintendent persuaded a fellow Mason among the Union officers not to burn the house. After the Civil War, William S. Battle rebuilt the destroyed Rocky Mount Mills, raising a brick building on the original stone foundations. The rebuilt mill could consume 700 pounds of cotton a day, turning out 500 pounds of cotton yarn and 1,200 yards of shirting. Battle erected another brick building after fire again devastated the mill in 1869. In 1883 financial problems forced him to give up control of the mill, which was reorganized by a board of trustees. Thomas A. Battle, Joel Battle's great-grandson, was elected secretary, and later president, of the new company. 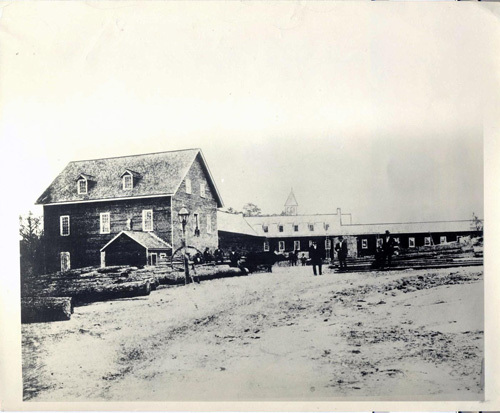 The business flourished, and new mill buildings were added in 1889 and 1894. A combination of increased competition, high cotton prices, and falling demand forced Rocky Mount Mills to close in June 1996, resulting in the loss of 320 jobs. At the time of its closing, Rocky Mount Mills was believed to be the oldest operating cotton mill in the South. The mill and mill village property and buildings have been designated a local historic district and are undergoing extensive redevelopment. Richard L. Mattson, The History and Architecture of Nash County, North Carolina (1987). Rocky Mount Mills: A Case History of Industrial Development, 1818-1943 (1943). 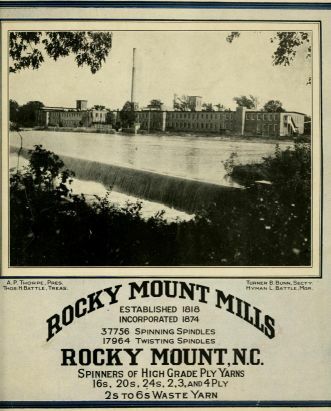 Rocky Mounty Mills : established 1818, incorporated 1874 : 37756 spinning spindles, 17964 twisting spindles : Rocky Mount, N.C. : spinners of high grade ply yarns (1900). Image courtesy of the Internet Archive. Available from http://archive.org/details/rockymountymills00rock (accessed October 3, 2012). "Photograph, Accession #: H.1952.40.1." 1952. North Carolina Museum of History.